One of the problems that has consistently plagued underground coal mining lies in the height of the coal seam that is being mined. This was the portal (i.e. 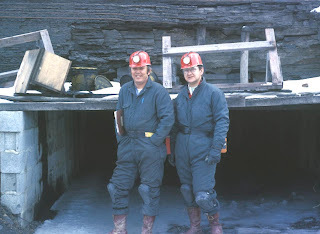 entrance) to a coal mine that we once ran a research project in, near Summersville, W Va.
Dr. Rupert and I in May 1975 at the portal of a W Va mine. (Note the kneepads). 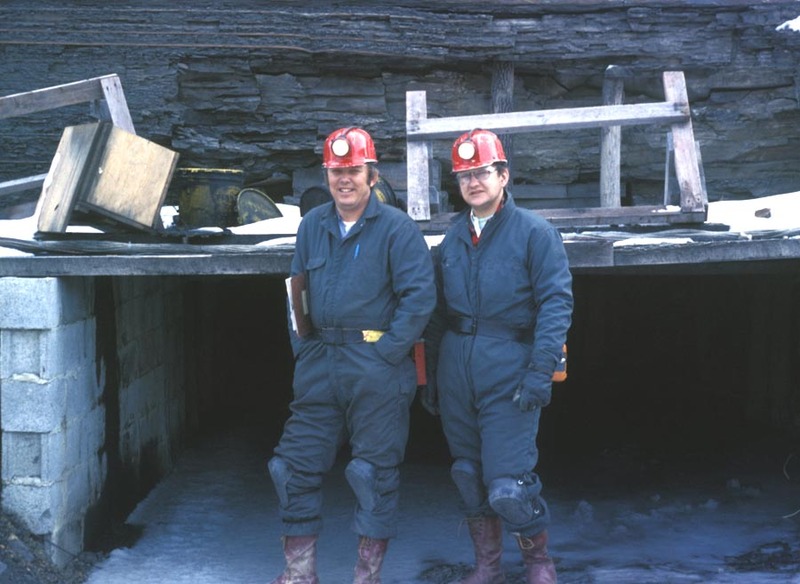 The mine was extracting only the coal, and you can see that the entry height comes to just below our shoulder blades, which made walking into the mine (about half-a-mile or more) very tiring, since you have to walk in quite bent over. As a result, the machines that work in these low conditions, have the operators lying almost recumbent as they steer and operate them. Back in earlier times, however, before there was much machinery underground, conditions were much different. And so today I thought I would talk a little more about those early conditions and how changes began to evolve. He was fitted with a flannel shirt, wide trousers, a cap, a smock-frock, and heavy nailed boots. He walked the two miles to the mine to be there at 6 am and he earned tenpence a day, except that the mine rarely worked more than half days, so that he made around 30 pence (when 240 pence made a pound which was worth about $4 at the time I believe) a week. After a ten to twelve hour day underground he then had to walk home. He was lowered into the mine on a chain fitted with loops, and then walked to the working face, having been given a candle to light the way. His job was to haul at the front of a tub, so that he took off all, but his trousers, socks and boots and his flannel cap. 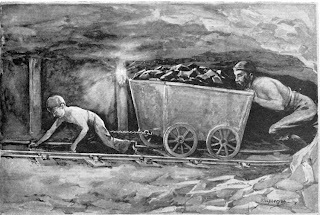 The man I had to work with showed me how to place a leathern belt around my loins, with a light chain attached about a yard long, which was hooked to the front of the small wagon of coal thus pulling from the front while the man pushed behind. 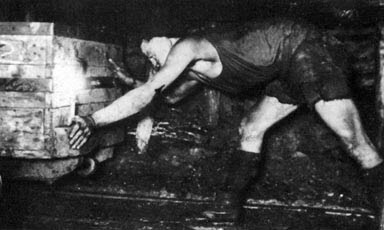 The mine was worked by subletting different jobs, thus a miner would work in measures of a“stint” which was two yards wide, by a yard deep to mine the coal. He loaded the tub from the face of a tunnel that he was driving into the coal, and then swopped out a full and an empty tub to continue. this process was worked in what they called “stages”, or lengths, a man having one stage, and then two boys the next, then another miner, and then two boys, and this was continued throughout the whole length. Now it will be seen that every pair of boys were running between two men – one at each end of their stage, and the great concern of the boys was to meet the man at either end, so as not to keep them waiting. . . .(if late) The man at the other end would be waiting with his empty truck (tub) and the probability was that the boys would be beaten with his strap. The men were paid by the ton delivered to the shaft top (a token in the tub marked who had loaded it) but the boys were paid by the day, and thus not nearly as well rewarded. Rails were the first major improvement, transitioning from just dragging the corves on one’s back, which had been the earlier method. But the tubs had still to be moved manually. 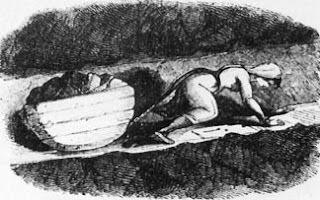 It was pictures such as this, that had led to the legislation that got women and young children out of the mines in 1842. Woman hauling a corf, Royal Commission Report, UK, 1842. They were replaced, in large part by ponies, but there was an immediate consequence. It had been possible to use people to drag tubs along in low coal, but that doesn’t work with ponies. (And in some seams they still remained impractical). The ponies had the advantage that they could pull more than one tub at once, and with the restriction on height gone, they were more frequently made of metal. You may notice the lad riding on “the limmers.” That was, strictly speaking, forbidden, though I think we all did it. 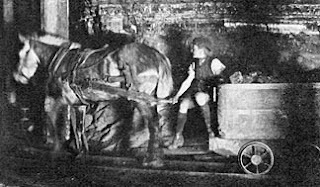 As mines became more productive, so the ponies could not keep up with the number of tubs that had to be hauled down the access roads, and they were, in turn, replaced by long “endless” ropes of wire, to which we attached the tubs, and which then hauled them from around the face area down the mile or more to the shaft, where they were disconnected, loaded onto the skip and hauled to the surface. But I’ll talk about the first steps in mechanization next time.